← One for the Watchlist – Elders Ltd.
It’s good to be back! I hope readers will excuse my weeks-long radio silence. A full travel itinerary took me to Chicago, Savannah, and elsewhere for business purposes and otherwise. During this stretch I also found the time to participate in a webinar, talking about strategies I use to identify attractive companies. A replay can be found here. My segment starts about an hour into the recording, though sadly the audio recording and the Powerpoint slides I used seem to be badly out-of-sync. Today’s value idea is a company I came across only recently, and one I own in size for Alluvial Capital Management, LLC clients. It has practically everything I like to see in a micro-cap stock: healthy top-line growth, expanding margins, excellent free cash flow, capable and shareholder-oriented management and best of all, a very modest valuation. Rand Worldwide, Inc. is a value-added software reseller. Design and engineering companies use complicated and expensive software suites from companies like Autodesk, Dassault Systemes, and Autonomy. However, these software packages are not exactly effective if employees are not properly trained in their use, or if the software won’t integrate with other software systems, often older or proprietary. This is where Rand Worldwide steps in, providing training and software management services that help companies maximize their software investments. Rand’s relationship with Autodesk is especially important, with Autodesk products accounting for 95% of Rand’s software resale revenues. Rand’s recent results have been strong, with total revenues rising 11.0% in fiscal 2014 to a record $91.6 million. This revenue growth is being buoyed by chief software supplier Autodesk’s own strong results. After years of moribund revenues, Autodesk returned to growth with sales rising 3.9% year-over-year for the twelve trailing months completed July 31, 2014. More recent results have been even better, with revenues rising 8.6% for the quarter ended July 31, 2014 versus the same quarter one year ago. 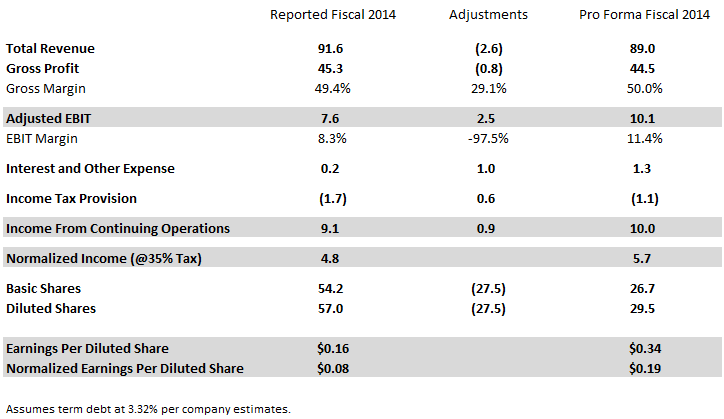 For the fiscal year ending January 31, 2015, Autodesk is guiding for revenue growth of 7-9%. These results are worth watching, because Rand’s own revenues appear to track closely with the rising and falling fortunes of Autodesk. Rising revenues and good cost control creates positive operating leverage. Rand’s results are the perfect example. The year’s 11.0% revenue increased resulted in a 59.6% increase in operating income and a 42.8% increase in EBITDA as the company was able to spread stable fixed costs over a larger gross profit base. Operating margins, adjusted for a one-time goodwill write down and contingent consideration change, rose to 8.2% from 5.7% the previous year. Looking below the operating income line, the company’s minimal interest expenses and net tax benefit allowed it to report a large net income figure for the year just ended. In Rand Worldwide, we have a company experiencing healthy grow and record revenues, which is leading to margin expansion and large earnings increases. A nice scenario. However, that’s just the start. Since the end of the fiscal year, Rand has taken multiple steps to increase its market value. First, the company has sold off a loss-making division, Rand Secure Data. The sales proceeds were minimal, but by selling the division Rand disposed of a major headwind. In 2014 alone, Rand Secure Data was responsible for an operating loss of $2.6 million. Rand’s trailing operating income ex-Secure Data would have been 34.1% higher. Second, Rand Worldwide is in the midst of completing a huge share tender funded via a debt issuance. In the tender offer, Rand Worldwide will repurchase 27.5 million shares, equal to 50.5% of basic shares outstanding. The tender price is $1.20 per share and will cost the company $33.0 million. The cash outlay will be funded from cash on hand, plus a term loan of $25 million. Rand will also enter into a revolving line of credit sufficient to support business operations. A leveraged recapitalization makes abundant sense for a company like Rand Worldwide. The company generates a ton of cash and has minimal investment requirements. Prior to the recap, the company used practically no leverage, so replacing a large chunk of the capital structure with cheap debt should reduce its cost of capital significantly. From a sheerly mathematical perspective, the figures are incredibly compelling. Per its press release dated September 29, Rand earned 16 cents per diluted share from continuing operations. At a repurchase price of $1.20, rand is buying its own shares at an earnings yield of 13.3%, compared with a cost of debt that will likely fall in the mid single-digits or lower. Rand has released pro forma financial statements for the recently completed fiscal year as if both the Secure Data sale and the tender offer had been completed at the very beginning of the fiscal year. In additional to the company’s own projections, I’ve gone ahead and provided net income estimates at normalized tax rates. On a trailing basis, the Secure Data divestiture and tender offer/recap would have had a major impact on normalized earnings per share. As I write, Rand shares last traded at $1.29, with a market cap (pro forma for the tender offer) of $38.1 million, fully diluted. The company is extremely cheap on both an absolute basis and in comparison to similar technological services companies. I always like paying mid single-digit multiples for healthy and growing businesses, but Rand has another factor that sweetens the deal: highly competent and incentivized owners. Once the tender offer is completed, Rand’s majority owner will be Peter Kamin, by way of his 3K Partnership. I have long admired Mr. Kamin and his track record (in general and with micro-cap stocks) is to be admired. Peter Kamin was a founding partner at the extraordinarily successful ValueAct Capital, and left to found his own firm in 2011. Long-time readers of this blog may recognize Mr. Kamin’s name from his involvement in Calloway’s Nursery and Rockford Corp. Examining another of Mr. Kamin’s ventures may shed some light on a potential future course for Rand Worldwide. Peter Kamin is a large shareholder and director of MAM Software Group, Inc. a company that sells enterprise software to the automotive after-market industry. This software provides function like inventory and store management for tire distributors and other similar businesses. Rand Worldwide and MAM Software Group are not identical; Rand mainly sources its software elsewhere while MAM develops and sells its own. However, the two businesses are like enough that similar strategies apply to managing and growing each company. When Mr. Kamin joined MAM Software as a director in May, 2012, MAM traded over-the-counter at a price of just over $2.00. Trailing revenues were $25.7 million and trailing EBIT was $3.9 million. 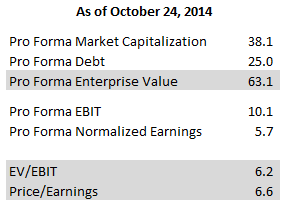 MAM’s enterprise value was $26.9 million for an EV/Revenue multiple of 1.0 and an EV/EBIT multiple of 6.8. Fast-forward to the present. Since May of 2012, MAM uplisted to the NASDAQ and grew its trailing revenues by 19.3% to $30.7 million. Operating profits are actually down on higher R&D and marketing expenses, which the company characterizes as investments in the company’s future. But the company’s share price? Up 128%. MAM now trades at an EV/Revenue multiple of 1.9. That’s the power of moving from the obscurity and neglect of the OTC markets to the spotlight of the a major exchange. MAM’s business certainly grew, but the price appreciation was mainly a factor of increased investor awareness, which lead the company to trade at a more normal industry multiple. I anticipate a similar story from Rand Worldwide. If the company can build on its revenue and profit momentum, I expect Mr. Kamin will list the company on a major exchange and allow the market to re-price Rand to an industry standard multiple. An EV/Revenue multiple of only 1.0 times current revenues would mean 68% upside for shares. Or, he’ll take it private. He’s done that, too. Anybody remember Abatix? Also Kamin. Of course, things might not turn out so rosily for Rand. If customers were to sour on Autodesk’s software offerings, demand for Rand’s training and management services would be impacted. It’s also possible that a bad economy could hurt revenues, or the company could make an ill-considered move into an industry where it lacks expertise. All in all, I view Rand as a very cheap way to invest alongside a very shrewd operator in Mr. Kamin, and to take advantage of the company’s smart financial engineering before the market takes notice. Alluvial Capital Managment, LLC holds shares of Rand Worldwide, Inc. for client accounts. I get the impression that the purchase argument is based to some extent on one good year, so I passed on it. Also a first review indicates that the company has a lot of tax loss carry forwards, so they will be paying minimal taxes for some years. A big chunk of reported 2014 net income was an adjustment to deferred taxes (reversing reserves). Fair enough. I view the revenue increase as sustainable and likely to continue as Autodesk benefits from a software release cycle and the transition to a subscription-based model. Rand does have NOLs, but unfortunately a good portion of these expire in 2014-2015 and their use is limited by the change in control that has occurred. I don’t consider the NOLs a major factor in Rand’s value. As majority owner, couldn’t Kamin just take the company private at a lowball price and leave minority shareholders in the dust? He has been a director since March 2012, and he has already made a good paper profit on his investment, so I don’t see any other reason why why he now wants to become majority owner other than to take the company private. Theoretically, yes. Kamin could try to force a low-ball offer through at the expense of minority shareholders. But I think he became majority owner simply because the opportunity was there. Kamin purchased the majority of his stake from the former private equity owners of the company, and will become majority owner once the tender offer is completed. He saw an opportunity to increase his stake and took it. I don’t know why the private equity fund wanted out. Client redemptions? Fund winding down? Regardless, it was a good opportunity for Kamin and I think it’s a good opportunity for other investors as well. Thanks for the article. I am a big fan of Kamin. 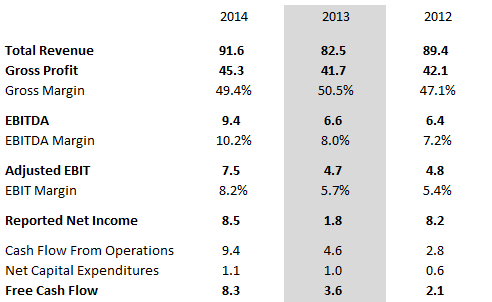 Any idea what operating income for the company would have been in 2012 and 2013 without Rand Secure Data? Rand is an interesting company. GM has been stable for the last 10yrs… but revenues have been all over the place. There must be pretty decent operating leverage in place and that tender offer just adds more to it. Kamin must like what he see happening. The biggest question is will he share the outsized gains with minority shareholders or take it private? Well I guess the better question to ask is if he has the liquidity to take it private. It is possible that Kamin takes the company out before the real gains arrive. But it’s also possible that he lists the thing and uses it as a platform. It’s all speculation at this point. I would wager that he does have the liquidity. His 3K Partnership owns several other successful businesses in whole or in part, and he could either borrow against those or do a dividend recap to generate enough cash to take over Rand in the entirety. Notice the company just cancelled the financing provision of the tender offer. I think Kamin stands ready to backstop the offer if the term loan is not in place in time. Do you worry that the reason there is a low multiple on earnings / EBITDA is because they are cyclically peaking? ADSK just rolled out new products and switched to a subscription model, which is likely leading to a short term boost. how do you get comfort that revenue a year or 2 from now will not sharply decline as the market place all becomes current on ADSK’s new roll out? Rand’s biggest risk is the possibility that Autodesk’s revenues will stagnate. I think the sorts of economic activity that benefit Autodesk are only just now recovering to normalized levels as companies expand capacity. This is really a jockey bet. I have a ton of respect for Peter Kamin. I think he’s a sharp businessman and I don’t see him taking control of a business that is about to see its margins revert. If anything, I expect him to find efficiencies to wring out. I just read a note on another website talking about how all this 3D printing increases the need for ADSK products. It seems 3D printing is still in the early innings so that’s a good sign. In addition if they switched to a subscription model that should actually smooth out earnings or are you insinuating that the recent increased sales are due to people buying media versions so they don’t have to use the subscription? I got very interested after reading this post, thanks for the great write up. After doing some initial research I was all set to jump in, however I then came across the mechanism they are using to fund this buyback, a $25 million dollar loan repayable over only 5 years. The repayments are going to be around $5.45 million per year (using 3.5% rate on a loan calculator), while I’m guessing the interest expense from the $10 million credit line will cost $0.25 million per year (assuming they access half of it at 2.5%). This will bring total repayments up to $5.7 million. Their total income for 2014 was only $7.33 million excluding the income tax benefit of 1.723 million. For 2015, after removing the now sold data divisions losses of $1.2 million, I can see operating income being between $8.5 and $9 million. The loan repayments are going to reduce income down to between $2.8 and $3.3 million. I’m very worried about the short period of time to repay such a large loan, why not extend it over 10 years? But then could that maybe what management want, a lower share price will make it cheaper for them to increase their holdings at no cost to themselves but at shareholders expense? Could this explain why the SP has barely moved since they announced the tender? Normally if a company announced they were buying back half their shares the price would rocket. On another issue, this share tendering will obliterate every bit of shareholder value from the balance sheet. The majority of the cash will be used up and an extra $25 million of liabilities will be added. Net tangible assets are presently just $20.20 million. The added debt (25 million) and expenditure of cash (8 million) will reduce this to a negative $13 million approx. To summarise I guess the point I’m getting at is that net profit could be reduced down to around $3 million from $7.5 million and the balance sheet will be stripped bare to achieve this. Am I way off? I feel like there is something obvious I must be getting wrong? Quick correction. Principal payments on debt don’t reduce earnings, they reduce cash flow. (Cash interest reduces both.) So yes, if the company must repay its term loan in equal installments over five years, that could deprive the company of some investable cash. However, this is not a capex-heavy business. In fact, it generates a lot of excess cash in good times. I had not seen any indication that the term loan would be due in installments, but even if so, I don’t see that as a problem. I’d caution you against evaluating a software services company on tangible assets or equity. The assets that create profits at Rand are its salesforce and intellectual property, not physical plant. The costs of these show up on the income statement, but their value does not appear on the balance sheet. Not knowing that loan repayments are exempt from the income statement was that ‘something obvious’ that I was missing! Learn something new every day. I can see it much more attractively now, yes the repayments will still be there but the FCF should be more than double repayments, as Depreciation and Goodwill Impairments are two non cash expenses. FCF of around $11 million before repayments looks realistic. If they do manage that level of FCF, I think the stock will be off to the races. Given that Ampersand acquired Rand in 2007 (likely from their 2006 vintage fund), I suspect that the most likely reason for exit is fund life constraints. Also, Ampersand doesn’t list Rand as a current or former portfolio company on their website, which might lead one to reasonably speculate that the investment was something less than a home run. You’re probably right. If I recall correctly (and I may not) Ampersand made a small amount of money here. But probably not anywhere close to what they were targeting. Your ‘re right.. i am agree with you.. But probably not anywhere close to what they were targeting. It’s March, which means March Madness is nearly upon us. For big college hoops fans, it’s the most wonderful time of the year. For the more ambivalent or completely clueless, all the talk of brackets, sleepers and Cinderellas — not to mention friends, loved ones, or co-workers yelling “onions!” — can be a little intimidating. So march madness game 2019 live stream this is a guide to answer some questions you might have about America’s biggest sports tournament. Are you looking for an online ‘write my essay for me” service? Look at the facilities offered by Buy Online Essay. Our firm comprises of professionals writers with a background in various fields. We can write on any topic and deliver exceptional results! Contact our customer care service and place an order now!